Welcome to www.wfking.de. 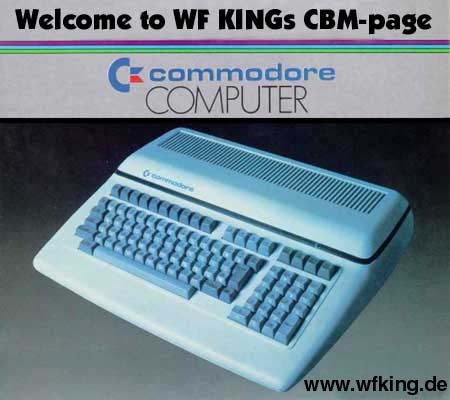 My CBM-page on this site offers information about the Hardware and Software of old computers from Commodore Business Machines (CBM). As for the C64 and VC20 there are enough other pages in the web, this page deals mainly with the series 2000, 3000, 4000, 8000 and 600 / 700. The aim of this page is NOT to list all details of every machine, but to give a clear survey of the family of the CBM - computers. My name is Winfried Falkenhahn. One of my favourite hobbies is collecting and using old computers produced by CBM (Commodore business machines). Since I got my first computer (C64 with floppy 1541) at christmas 1989 I have been interested in all 8-bit-machines from Commodore and also in the Amiga-family.